Why pay for someone to write your product descriptions? Why employ a copywriter when you could do it all yourself? We explore the reasons why getting a professional to write your product descriptions is a good idea. Writing – it’s something almost everyone can do. 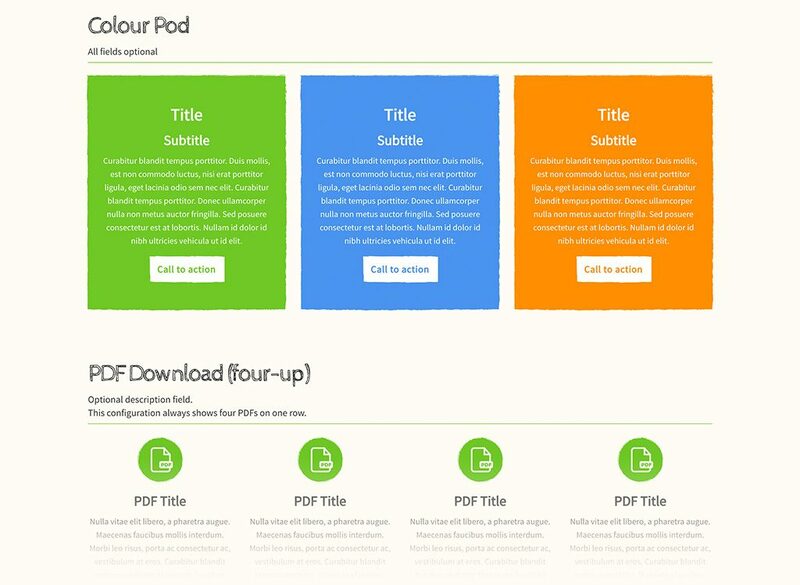 So, when it comes to the creation of copy for a website project – that means product descriptions, landing pages, positional statements and microcopy (the copy that guides you around a website) – some people opt to do it themselves. Ok, maybe we’re being a little cheeky on the last one. 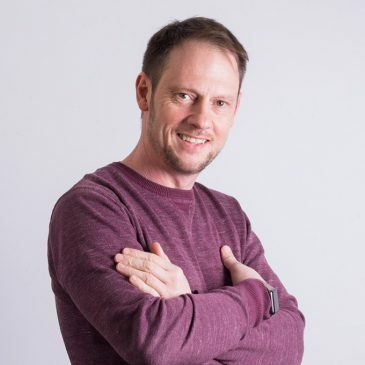 But many business owners find it hard to remove themselves from their website and place their trust in a copywriter to produce the copy for the website. So if everyone can write, why pay someone to write your website copy? Copywriters are professional writers. We spend days pouring over the latest techniques in web writing, attend writing courses and usually come from a background in journalism, holding degrees in English. We’ve written hundreds of thousands of words of copy in the past, and know exactly how to coin an interesting phrase and use persuasive techniques to enforce the subject on which we are writing. Many business owners who decide to produce the content themselves soon realise that writing can be incredibly time consuming. There’s a lengthy research phrase, the actual time spent writing, then many rounds of proofing and approval. 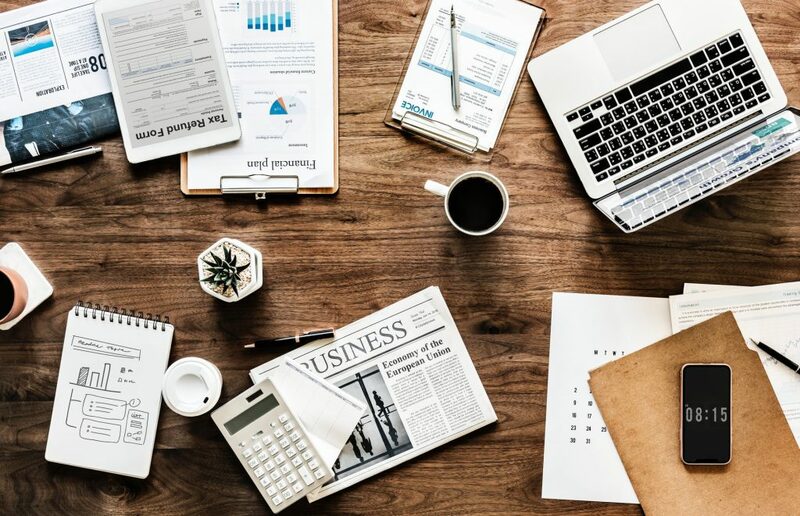 Lots of marketing managers or managing directors will delegate the job of writing website copy – one of the most pivotal aspects of a successful website – to a junior or executive. This means one of the most important persuasive tools available to an online retailer is left to someone who has limited experience, limited time and almost zero knowledge of the craft of web writing. Eesh. Product descriptions created by a professional copywriter are written with SEO sensibilities in mind. This means they’ll target specific keywords that your customers are searching for and be structured in a manner that will help Google understand what you sell. Search engine optimisation is a difficult skill to master and takes a bunch of research – it’s often a lot more simple and cost effective to let an expert do it instead. 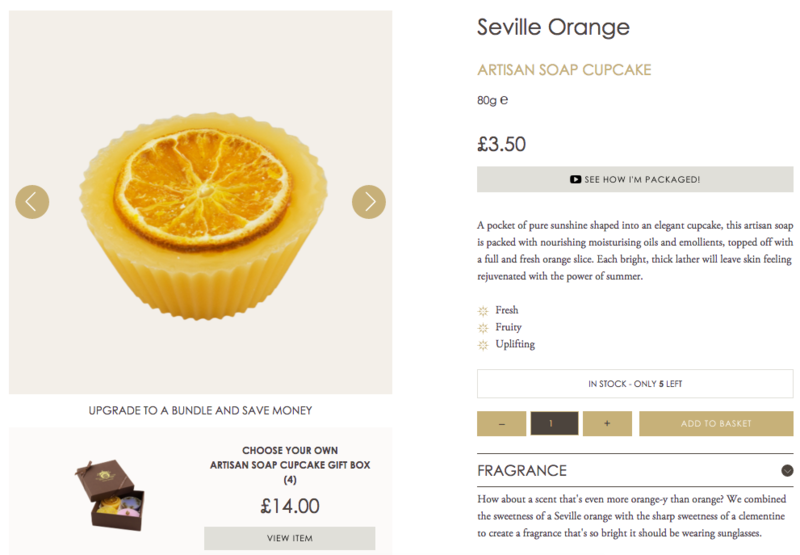 Product descriptions aren’t always about being SEO friendly. They offer another space on your website to express your brand tone of voice and personality, reinforcing the ideas and ethos behind your brand at a pivotal stage of a purchase. 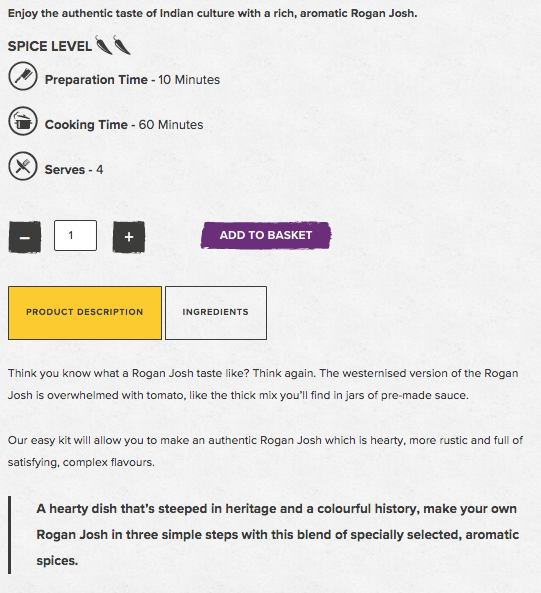 The end result is simple – better product descriptions mean more sales. A combination of being persuasive, informative and entertaining (not to mention easier to find on search engines) means that investing properly in original, engaging product descriptions will generate more sales. We helped establish a tone of voice for The Yorkshire Soap company, then got to work writing hundreds of original product descriptions for the brand new website (launched 2015). Along with the products and static pages, we helped write the fragrance descriptions for The Yorkshire Soap Company. These sections had to capture the essence of each scent and explain some of the ways the fragrances were achieved. MonsterShop was previously several different businesses under the ‘Monster’ moniker. We helped them consolidate their separate sites into one, and in doing this, created a tone of voice for this new unified brand. 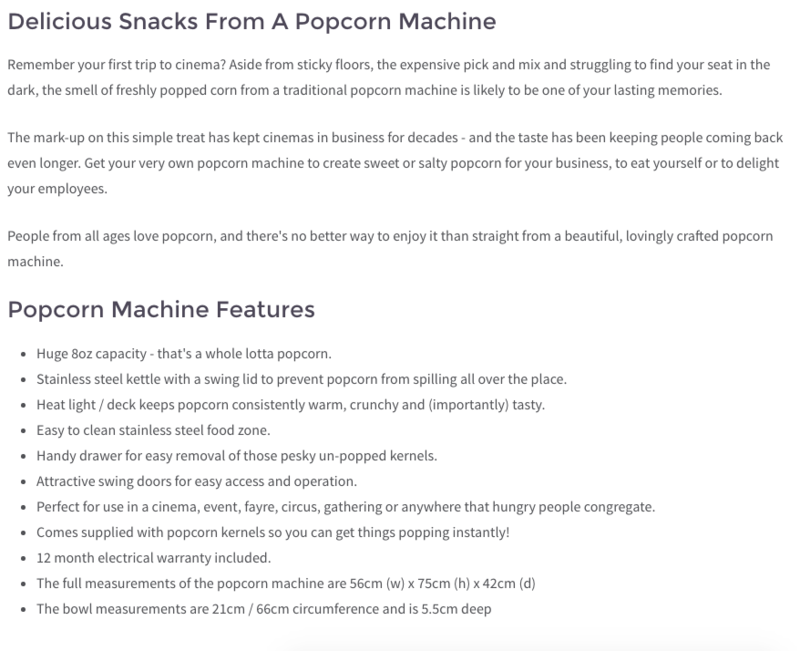 We also wrote this popcorn maker description for MonsterShop to use a guide to all future product descriptions. 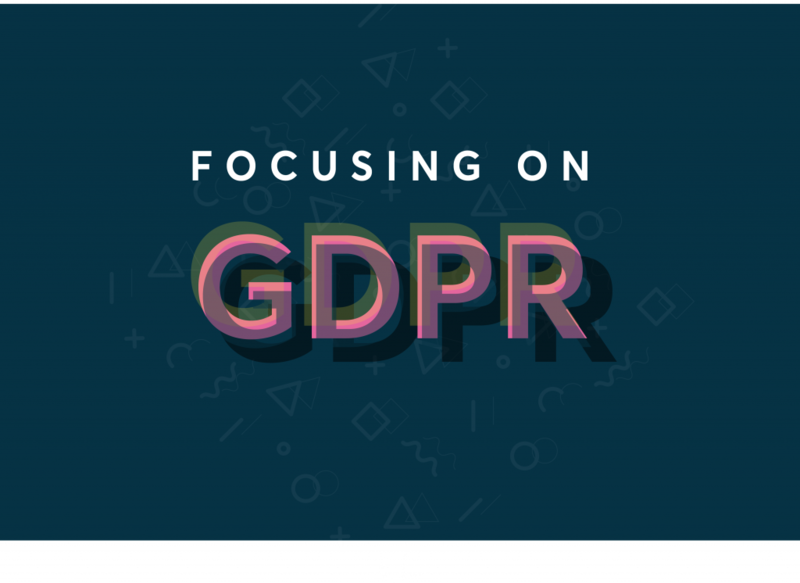 It’s intended to be written in a relaxed style, informing users about the key features, while evoking a sensory and emotional reaction to the product. Bombay Street is is an Indian food brand who produce authentic, easy-to-use spice kits so anyone can create traditional Indian cuisine at home. They wanted to upgrade their already brilliant brand and needed some product descriptions to support each vibrant, delicious product. Need a hand with writing product descriptions? Get in touch to find out how our content team can help you out with writing product descriptions and a whole lot more.